A letter date September 1995 from a gardener in Gloucestershire states: "I would like you to know the remarkable success I have had using Humates. In particular I have never had growth like it on camellias and one hybrid rhodo has put on two years of growth in one season, ie now has two sets of buds for next spring. A young magnolia, having one flower last year has grown 9 branches 4 feet 6 inches long & is covered in fat buds whilst the same sized plant I gave to my son-in-law is still 3 feet in height with no buds. (Mine is 5 feet). Azaleas that have not flowered for years are now in bud." A feature in the Autumn 1998 issue of the Newsletter of the Fritillaria Section of the Alpine Garden Society, written by a user of Viresco™, showed that fritillaria keeling-over-disease could be prevented by using Viresco™ microbial products. He previously had had limited success with fungicides. A breeder of species gladiolus used Humate and Viresco™ for the first time in spring 1997. At the end of August 1997 he wrote to say "growth and results this year in all my plantings that have had Humate and Viresco treatments have been remarkable and I have not used any insecticide or fungicide whatsoever". A nurseryman, growing African Violets, has been using granular Humate in his mixes since February 1996. 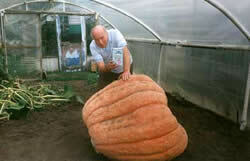 He has cut down his growing time from 12 weeks to 10 weeks and improved the colour of his plants. A judge at the 1996 Hull Carnation Show wrote to us and said "One Exhibitor had outstanding carnations with good strong stems and excellent flowers. ...... He tells me that he used Humate and Viresco™ which he obtained from you." We have a microbial product that is contained in Viresco™ Hydroponics. This product was used at one nursery that grew about 500,000 tomato plants using the NFT system under 34 acres of glass. Fungicides were eliminated. New owners moved away from NFT and from tomatoes and now do not use our product. At the Gateshead Show, exhibitors who are users of our Humate and Viresco™ products won awards in the following categories: 2 pot leeks - 1st prize; 2 intermediate leeks - 1st prize; 2 blanch leeks - 1st and 2nd prizes; 3 different leeks - 1st, 2nd and 3rd prizes; 2 onions - 1st prize; collection of 6 vegetables - 1st and 2nd prizes and "Best in Show" exhibit; collection of 9 vegetables - 2nd prize; collection of 4 vegetables - 1st and 4th prizes; 4 white/4 coloured potatoes - 2nd prize; 4 white potatoes - 1st and 4th prizes; 4 coloured potatoes - 4th prize; 2 onions - 1st prize; 2 celery - 1st prize; truss of tomatoes - 1st and 2nd prizes; 6 tomatoes - 2nd prize; 6 broad beans - 2nd prize; 6 peas - 3rd prize; 2 long carrots - 1st prize; 2 stump carrots - 1st and 3rd prizes; 2 long beet - 1st and 4th prizes; 2 parsnips - 2nd prize; sweet peas - various classes 6 first prizes, 2 second prizes and 1 third prize. One customer from Co. Durham, having used both Humates and Viresco™ during 1996, put numerous flowers and vegetables into his local Show. Out of 186 available points, he took 174 points! He put his success down to using Humates and Viresco™. The President of one regional fuchsia society used Humate and Viresco™ for the first time in 1996. In September of that year, she told us that her plants had never been better as a result of using this products. On 4 golf courses, trials with Humate and Viresco™ products took place in the summer of 1998. On one practice green, over a period of 2 months, root biomass was shown to go up by an average of 29% with no change in the control plots. Bacterial counts went up by 98% whilst in the control plots they went down by about 9%. In September 1995, we met one of first customers for Viresco™ . In June of that year he stared to use Viresco™ Soluble and Viresco™ Foliar in his hanging baskets. He had been trying to win, in his local Show, the 12" hanging basket competition for several years but had never succeeded. That year, he took the first two places and put it down to using Viresco. Each year, in Ashington, Northumberland, the World Leek & Onion Championships are held. For the six out of the seven years 2000 to 2006, the winners of the £1300 prize for the three pot leeks exhibit are have been users of our granular Humate (plus other of our products as well). In 2004, the 2nd and 3rd prize winners also used our Humate. In 2005, the winner had not used our granular Humate but is a user of other of our products. However, the second and third prize-winners were users of our granular Humate.